Motor rotation is transferred to the legs via cranks and linkage rods, causing the Mechanical Racehorse to gallop. Two linkage rod holes on the rear legs allow you to choose between two running styles. 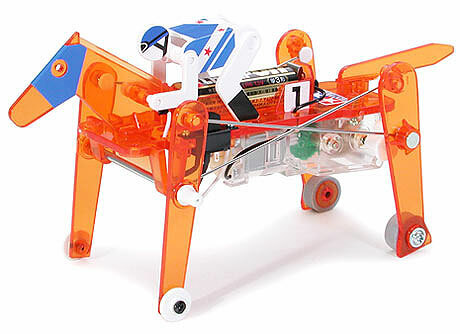 The mechanical horse is comprised of mainly transparent orange plastic, which allows you to easily see the internal mechanics in action. This kit it includes 3 different sets of stickers. Each sticker set contains a horse’s mask and number and jockey’s clothing. These stickers let you make your model easily distinguishable while racing with friends! Gearbox, motor, and control switch are included. Stickers for horse’s mask and number, and jockey’s clothes are included. Continuous running time with alkaline battery: 1.5 hrs.